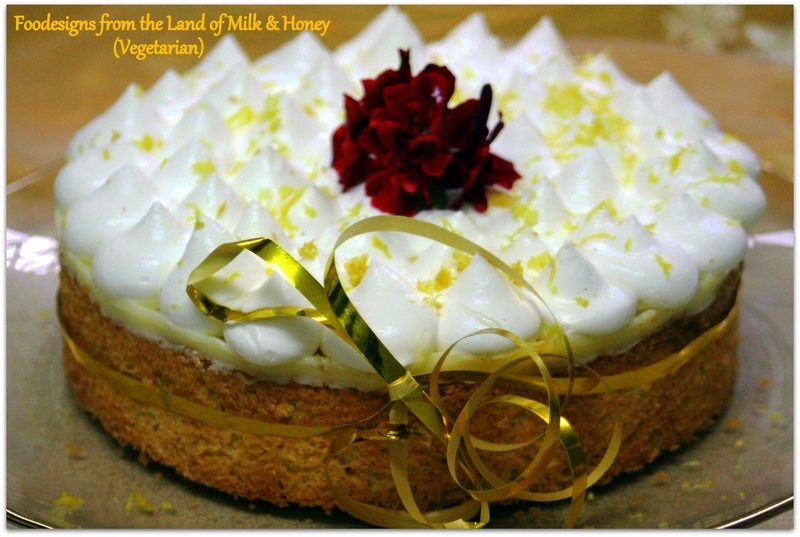 Since Citrus Fruits are in season now, here is a Lemon-coconut Gluten Free cake that is also kosher for Passover (in case you are looking for ideas for next Passover). Whisk eggs and sugar in your mixer for at least 5 minutes ! till it triples in volume and becomes foamy and light. Add almond flour and coconut and fold gently. Add melted butter and fold till the mixture is even. Pour batter into a non-greased pan (so that the cakes sticks to the sides) and bake for 15-20 minutes till the cake is fluffy and ready. Combine the cornstarch and sugar in a stainless steel bowl. Add the lemon juice and mix till the cornstarch is dissolved. Add the lemon zest and the eggs and whisk. Heat the heavy cream in a saucepan till it starts to bubble. Remove from heat. Place the lemon-mixture bowl over a pot with simmering water and whisk while you’re adding the heated heavy dream. 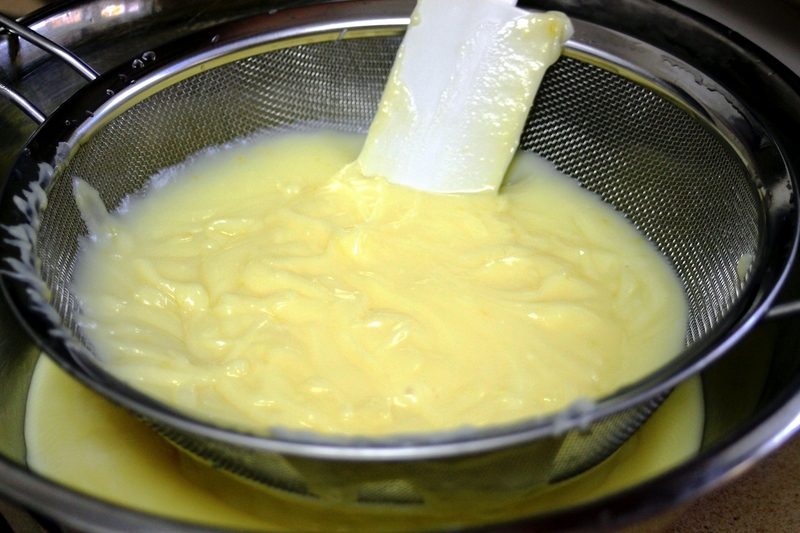 Whisk until the mixture reaches 81 degrees Celsius/178 F. or until it thickens like pastry cream. Add butter and stir till the butter melts and is incorporated into the cream. 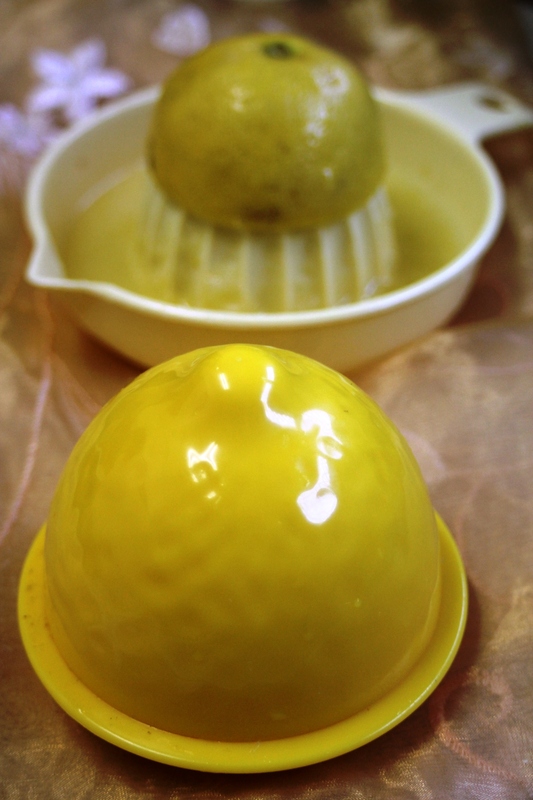 Pass the cream through a fine strainer and cover with cling film. Refrigerate for several hours. Spread 2/3 of the refrigerated cream over the coconut base. 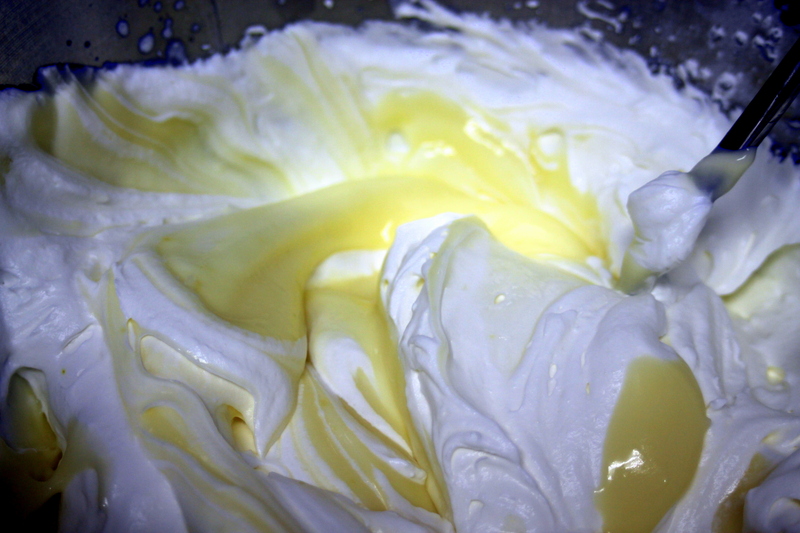 Whip 250 ml of 38% heavy cream with 2 Tbs sugar till a soft whipped cream is formed and then gently fold in the remaining lemon cream. 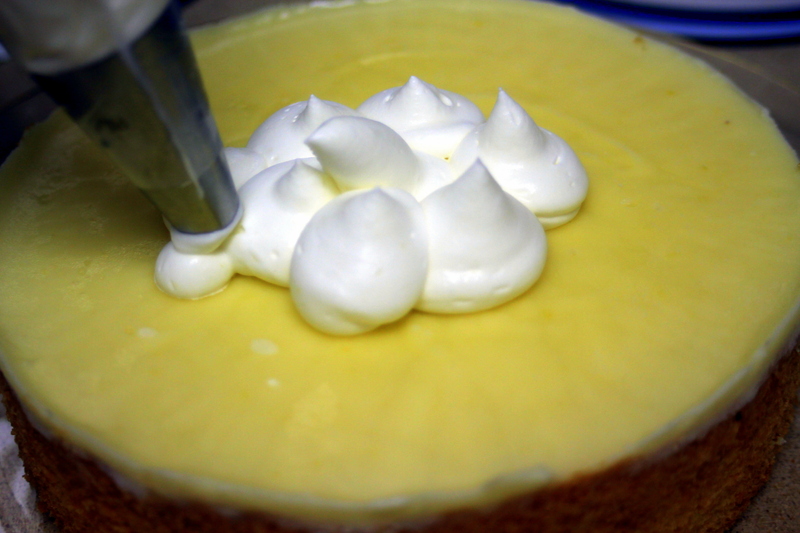 Spoon the lemon flavored Whipped cream into a pastry bag with a round nozzle and pipe it on to the lemon cream. Decorate with toasted desiccated coconut and lemon zest. This entry was posted in Citrus Fruits, Desserts, Gluten Free and tagged cakes, citrus fruits, coconut, Desserts, Gluten-Free, Lemon cream, Passover. Bookmark the permalink. Thank you (-: and Welcome.